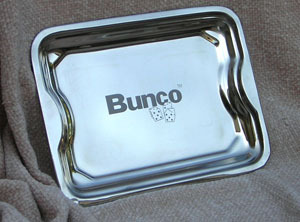 Bunco's own serving tray to complete your theme for your Bunco night. The perfect Bunco gift or the wonderful conversation piece for serving your Bunco guest. Etched with Bunco and three dice on a stainless steel mirror finish allowing lasting beauty.approximately 8 1/8" X 11"